This topic contains 3 replies, has 3 voices, and was last updated by Ochoin 4 days, 5 hours ago. 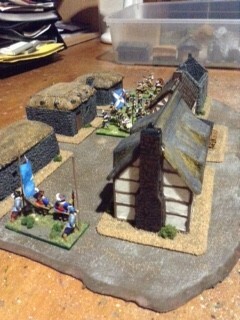 First mock-up of the centre piece for our ECW game at our local Show (in August). The village of Auchentoshan will have a cobbled road running through it, fences & walls etc but you will get an impression of it from these preliminary photos. 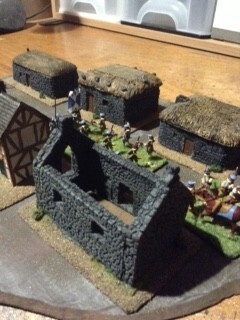 The Black Houses & roofless church are from Anyscale, the large thatched house is Dapol & the other, half timbered building is a resin pieceI’ve had for 20 years. This topic was modified 5 days, 19 hours ago by Ochoin. Very nice. That would be the Great Western Road running through it. It is not unusual apparently for a “lady’s whisky” to be battled over in Oz – Incidentally a “lady’s whisky” or “breakfast whisky” has a smooth and soft taste. This reply was modified 4 days, 11 hours ago by Alan Hamilton. The only whiskey I will drink is Lowland. I can’t abide a peaty taste. So “lady’s whiskey”…. My Italian in-laws call mey preference for flat white coffee “caffè per bambini” or ‘children’s coffee’ so I think there’s a pattern here. We’ll also have a smaller BUA we’re going to call ‘Bladnoch’. I don’t think many Aussies will get the reference. Now call the two villages “4X Gold” and “Tooheys Draft” & they’d get it.